P.E.A.F. would like to dedicate this page to those members whose inspiration, dedication, devotion, and legacy to our field will always live on. You are missed. Ken Snyder started his career with the Florida Department of Law Enforcement (FDLE) on August 6th of 2002. He quickly became an integral part of the evidence team touching the hearts of everyone he came in contact with. His can do attitude, easy smile and warm sense of humor cemented a bond in the work center and spilled over to any contributor who came to submit evidence. Ken’s giving personality and enthusiasm always showed, as he put everyone before himself to accomplish the task at hand. 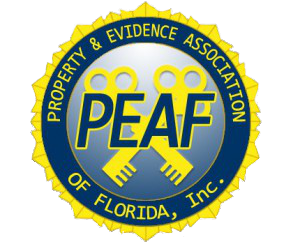 Ken loved being a part of FDLE and belonging to the Property and Evidence Association of Florida (PEAF). He was among the members who attended the kick off meeting for Chapter 7 of PEAF and attended the Conference in 2005 that made it official. He was a professional in all his endeavors and a source of great inspiration. Ken will be missed by all who had the privilege to know him, but rest assured he is smiling down upon us. Nancy Lee Shultz, 55, of Cape Coral, Florida passed away July 23, 2011. She was born February 17, 1956 in Gary, Indiana the daughter of Houston and Mary (Mundy) Johnson. She worked for the Cape Coral Police Department for 23 years. She was a member of the Police Benevolent Association and also a Founding member of the Property and Evidence Association of Florida. Nancy was a fun loving lady and had a wonderful sense of humor. She also was very generous and giving. She leaves to cherish her loving memory, her loving husband and soul mate, Harvey Shultz of Cape Coral, FL, children Cammie Scott-Donohue, and Darrick (Tina) Shultz, mother Mary “Janet” Johnson, 3 sisters, Brenda (Thomas) Finnerty, Sharon (Allan) Breyfogle, and Sandra (Stephen) Powell, brother Daniel (Debbie) Johnson, 4 grandchildren, Deshaun, Alexander, Hannah, and Abigail, as well as numerous nieces, nephews, cousins and countless friends. Jeffrey Butler Hoy of Oldsmar FL passed away on October 5, 2013. Jeff was a vendor for All American Air Cleaning Equipment and was also a huge supporter of PEAF. He would go out of his way to tell others about the benefits of our organization at events like the Police Chief’s Conference. He will be dearly missed by his wife, Wendy, and large, much loved family. We at PEAF will miss you as well Jeff. Thank you for what you did on all of our behalf. PEAF is proud to display our logo in pink to pay respect to the men and women who have succumbed to or honor those that are Breast Cancer survivors.